Mission-Charlo Bulldogs place third in the Western B/C divisional tournament. Polson Pirates are the new Western A divisional champions. BUTTE – Thirty-six Mission Valley wrestlers qualified for a shot at being crowned state champions during next weekend’s competition in Billings. 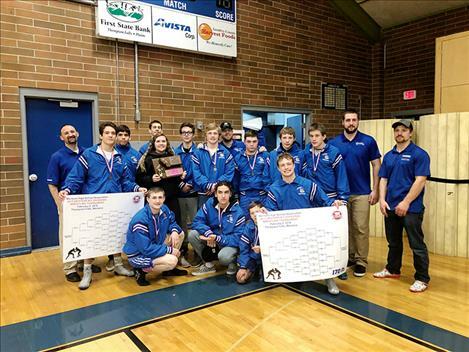 The Polson Pirates led the way by putting 15 wrestlers in the state competition, followed by the Mission-Charlo Bulldogs with nine, Ronan Chiefs with seven and the Arlee Warriors sending five. 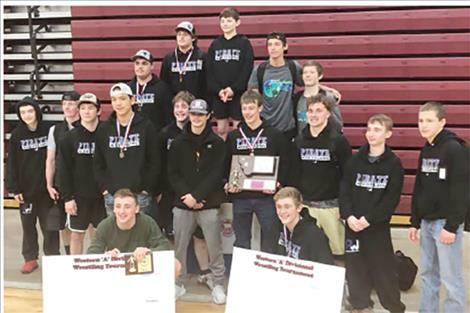 Polson also outscored Frenchtown by one point to finish first in the team standings at the Western A divisional state qualifying tournament in Butte on Saturday. Polson finished with 221 points followed by Frenchtown with 220 points. Ronan checked in at tenth with 77 team points in the 12-team divisional field. The Pirates crowned two individual divisional champions: Bridger Wenzel (152) and Hunter Fritsch (170). Pirate Rene Pierre (113) collected a second-place finish. Kedrick Baker (120) and Logan Adler (182) both placed third. Jasper Drake (285) nabbed fourth place. State tournament qualifying spots were also claimed by Maysn Cowell (126) and Jarod Farrier (132). Caleb Pierre (145) placed fifth in the qualifying rounds. Gavin Knutson (103) and Aaron O`Roake (205) placed sixth, and Garrett Croft (160) was seventh. Rounding out the Polson qualifiers were Kellen Norman (120), Tyren Stidham (126) and Kaleb Unger (160) all in eighth place. For the Ronan Chiefs, Justin Mays came home with an individual title in the 205-weight class, while teammate Trapper McAllister (126) finished second. Other Chief state qualifiers were Trevor Bartel (103) placing fourth, Julian Strait (126) finishing seventh, and finishing eighth was Jamison Webster (170), Jesse LittleBoy (182) and Persephone Sandoval (205). The Mission-Charlo bulldogs qualified nine grapplers and the Arlee Warriors qualified five for state action during the Western B/C Divisional tournament in Thompson Falls on Saturday. The Bulldogs finished the tournament third in team standings with two individual champions: Isaac DuMontier (152) and Isaiah Allik (170). Joining the others at state are second place finishers Darwin Adams (145) and Miles Anderson (205). Third-place finishers were Cole Gilleard (132) and Troy Matt (170). Fourth place finishers were Kody Dillard (103) Walker Murphy (120) and Ethan Diaz (160). For the Warriors, Colt Crawford (138) placed second. The third place finishers were Tyrel Thomas (103) and Skyler Titsworth (152). Fourth place finishers were RJ Knoll (126) and James Crazyboy (205). For the Warriors, Gage Sanchez (120) and Ashley Potts (160) placed sixth.